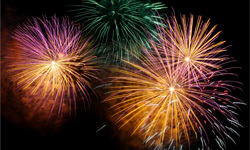 RoSPA, the Royal Society for the Prevention of Accidents is campaigning for an increase in awareness of the dangers created by setting off fireworks. Fireworks look magical but we must remember that they are made from explosives and are therefore dangerous. Even innocent products, such as sparklers, get five times hotter than cooking oil and if you were to put three sparklers together they would generate the same heat as a blowtorch. A fireworks rocket can reach speeds of up to 150mph; imagine the impact it would have if it were to hit a person at this speed. The majority of injuries caused by fireworks are to hands, followed by eyes and face. It is important that everyone adheres to the firework code. Educating children and young people in the correct handling of fireworks can prevent injuries from happening, as most injuries happen to under 17 year olds. Burns can scar for life. Make ensure you have a burns kit at the ready should an injury occur. A water mist extinguisher will quickly quench any fire and can even be used on clothing. The microscopic droplets of water from the extinguisher form a cooling mist over the fire and smother the oxygen, extinguishing the fire. Bonfire Night – stay safe and have fun! It’s that time of year where many of us will be looking forward to the celebrations of Bonfire Night. The tradition of wrapping up warm, toffee apple supper, sparklers, bonfire glow and spectacular firework displays all combine to bring crowds of people together, in awe of the decorative night sky that lies ahead. Last year, nearly 1000 injuries were caused by fireworks in October and November, with almost half of that figure being children. Don’t spoil your evening with unnecessary injury – stay safe and have fun! To celebrate Bonfire Night, Safelincs are running a limited time special offer on selected fire safety and first aid products. Make sure you’re prepared and keep your family safe. Act responsibly and enjoy your evening.